Known as the starting point for the Appalachian Trail, the Georgia mountains are in the northern part of the state and are actually part of the Blue Ridge Mountains. North Georgia has four distinct seasons and is one of the few parts of the state that almost always see snow during the winter. You may think that area plants would have trouble adjusting from the cold weather in winter to the hot humid temperatures of summer, but the plants in the Georgia mountains adapt to these extreme changing seasons just fine. American ginseng (Panax quinquefolium) is a perennial herb that grows to 12 inches in height and has dark green, serrated leaves that grow in groups of three. It blooms from June to August with a ball-like cluster of small, fragrant white flowers. American ginseng is not sought after for its leaves and flowers, but rather for its 2- to 3-inch pale yellow to brown root. Highly regarded for its aphrodisiac qualities and use as a heart stimulant, American ginseng has become quite rare and is now endangered. Goldenseal (Hydrastis canadensis) is a perennial herb that grows from 6 to 12 inches tall and has dark green leaves that grow palm-like in 3- to 5-leaf groups, somewhat resembling an image of an outstretched hand. It blooms from March to May with a small greenish-white flowers that give way to a small, tight, red clusters of fruit. Also known as yellow root, goldenseal has many medicinal qualities and is used to treat everything from sore gums to ringworm. It prefers part shade to shade and likes a moist, rich soil. Goldenseal is still harvested in the north Georgia mountains, but its popularity has resulted in over-harvesting and it is sometimes hard to find. 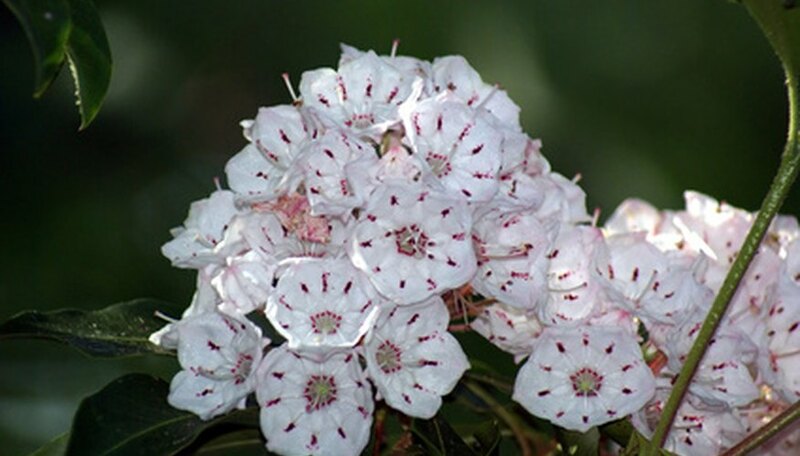 The mountain laurel ((Kalmia latifolis) is an evergreen shrub that normally grows from 12 to 20 feet in height, but may also be trained to grow as a small tree. It has glossy oval leaves that have a thick feel to them and change from light-green to a dark-green through the spring and summer before becoming a purplish color in the fall. The mountain laurel blooms in June through July with bell-shaped pinkish-white flowers that grow in clusters. It likes part shade and moist soil. The mountain laurel is widely seen throughout the north Georgia mountains and quite noticeable during its blooming season. Care should be taken, however, when small children are in its proximity, as all parts of the mountain laurel are highly poisonous and toxic if ingested. University of Texas at Austin Ladybird Johnson Wildflower Center: Hydrastis Canadensis L.
University of Texas at Austin Ladybird Johnson Wildflower Center: Kalmia Latifolia L.